The Society’s Commemoration Concert to mark the Centenary of the end of the First World War will be performed on the eve of the Armistice and Remembrance day. 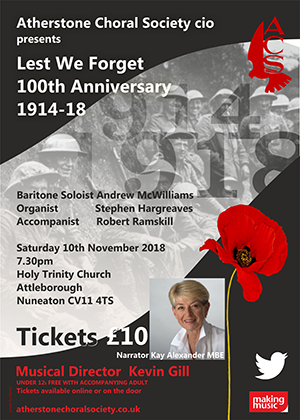 The programme has been specially chosen to mark this centenary and includes A Shropshire Lad by George Butterworth (1885 – 1916) which is a setting of poems by A E Housman; music from The Armed man, (A Mass for Peace) by Sir Karl Jenkins, as well as a selection from Howard Goodall’s work Eternal Light, which again uses First World War poems as its basis. Other well known pieces included are Vaughan Williams’ Towards the unknown Region as well as a selection of World War 1 songs and other appropriate reflective choral anthems. Amongst these anthems is Some Mother’s Son composed by Anthony (Tony) Moore, a long standing member of Atherstone Choral Society, and arranged for the choir by our resident accompanist and arranger, Bob Ramskill, and a piece by Laura Farnell, a setting of the poem Do not stand at my grave and weep. We are delighted to welcome back Kay Alexander, who many of you will know from her BBC newsreader role. Kay will be performing a number of readings and poems to complement what promises to be a lovely evening of music and readings.